The United States Congress designated the Havasu Wilderness (map) in 1990 and it now has a total of 17,801 acres. Arizona contains approximately 14,606 acres. California contains approximately 3,195 acres. It is managed by the Fish and Wildlife Service. The Havasu Wilderness lies within the Havasu National Wildlife Refuge which stretches along the Colorado River for 30 miles between Needles, California and Lake Havasu City, Arizona. Approximately one-third of the refuge—all of it in Arizona—is Wilderness. California later got into the act, adding almost everything north of Blankenship Bend on the Colorado River. This area shares its western border with the large Chemehuevi Mountains Wilderness. The Wilderness is rich in wildlife including quail, geese, ducks, grebes, cranes, rails, herons, egrets, falcons, eagles, bighorn sheep, coyotes, porcupines, foxes, and bobcats. Here you may see the endangered desert tortoise and the poisonous Gila monster. Exemplary desert hiking through creosote, ocotillo, blue-green paloverde, and pockets of saguaro promises solitude. 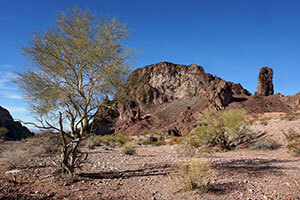 Planning to Visit the Havasu Wilderness? How to follow the seven standard Leave No Trace principles differs in different parts of the country (desert vs. Rocky Mountains). Click on any of the principles listed below to learn more about how they apply in the Havasu Wilderness.